Home » Baseball » 2015 Bowman Chrome Twitter-Exclusive Refractor Packs Are Back! 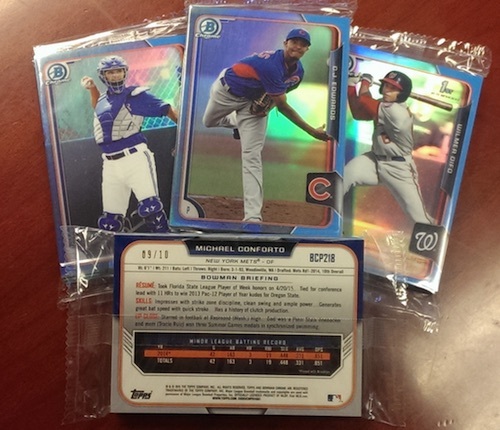 2015 Bowman Chrome Twitter-Exclusive Refractor Packs Are Back! Similar to what they did for 2015 Bowman Baseball, Topps is at it again with a fresh set of Twitter-exclusive Blue Refractors. Only available through the Bowman Twitter account, the limited set works as a partial parallel for cards from 2015 Bowman Chrome Baseball. Although no exact total of cards was provided, the ten-card packs will include nine base cards and one autograph. Each base card is numbered to ten copies and the signed options are limited to just three. Key subjects include Michael Conforto, C.J. Edwards and Lucas Giolito, among others. To be eligible, collectors must follow the Bowman Twitter account and participate in the contests that range from simple retweets to more creative endeavors. The giveaways will include "dozens" of packs and take place from September 17 to November 7. 2015 Bowman Chrome hobby BOX (BELLINGER GLEYBER TORRES SEVERINO DEVERS BRYANT)!